CSF stands for Configserver security and firewall. CSF is a configuration script built to provide better security to servers , at the same time providing a large number of configuration options and features to configure and secure with extra checks to ensure smooth operation. It helps in locking down public access and to restrict what can be accessed like only e-mails or only websites, etc. To add more power to this, it comes with a Login Failure Daemon (LFD) script that runs all the time to scan for failed attempts to login to the server to detect bruteforce-attacks. There are an array of extensive checks that lfd can perform to help alert the server administrator of changes to the server, potential problems and possible compromises. And many more. This post does not cover all the features and thus for more detailed information about each of the features read the "readme.txt" file from the csf folder that we will download. 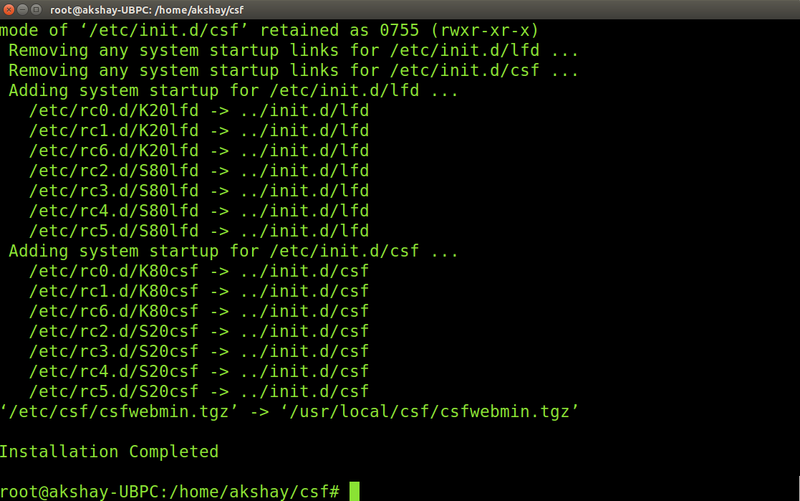 Now we extract the tar file in the home directory and move into the csf directory. The steps till here are shown in the image below. Now we are ready to install, but before we can, we will need to have root privileges else we will not be able to install. So, use the following command to gain root privilege and type in the password if asked. Once the installation is over successfully, the output will look similar to the image below. It is important to remove older firewalls or any other firewalls setup to protect the server. This is because the conflict of Firewalls can lead to failures or inaccessibility. You should also not install any other iptables firewall and if it already exists, then it has to be removed at this stage. Most of the systems is likely to have APF+BFD firewalls and has to be removed. So use the following command to detect and remove them if they exist. If you want to remove CSF completely, then just use the following two commands. CSF is automatically preconfigured for cPanel and DirectAdmin and will work with all the standard ports open. CSF also csf auto-configures your SSH port on installation where it's running on a non-standard port. CSF also auto-whitelists your connected IP address where possible on installation. But however full control can be taken by the admin and csf can be manually configured to suit the needs of the type of server. CSF is installed in the "/etc/csf" directory and the user requires root privileges even to access the directory. This directory consists of all the files required to configure and run the csf. Firstly, "csf.conf" is the file that helps enabling/disabling and managing every possible use and feature of csf. It handles all the configurations. The directory also contains various files like "csf.syslog" that contains where the log files will be kept, "csf.allow" file that is used to allow IP address through the firewall, and many more. the "-w" or the "--watch" option can be used to watch and log packets from a specified source as they traverse the iptables chains. This feature becomes extremely useful when in tracking where that IP address is being dropped or accepted by iptables. Do note that at any time time, only a few IP addresses should be watched and for a short period of time, else the log file gets flooded with these entries. To end the watch you will have to restart csf, as watches do not survive restarts. Go to the config file present in /etc/csf called "csf.conf" this is the config file. Search for "WATCH_MODE" and make the value "1". This enables it. use the following command to watch the ip. Make sure you change the IP shown below to what you want. Similar to allowing , IPs or ranges of IP can be blocked. But do remember that IPs present in the csf.allow file will be allowed even if it is present in the blocking file. To block IPs use the same process as for allowing it but instead of the "csf.allow" file, enter the IPs in the "csf.deny" file present in the /etc/csf directory. It is also possible to ignore IP addresses. That is the IPs provided in the file "csf.ignore" will bypass the firewall but can only be blocked if listed in csf.deny file. Above are just some of the many features that CSF provides. It is very useful and provides a very good security to servers against attacks and also provides full control to the configuration so that a server can run smoothly. To learn and use many other features of the CSF, refer to the readme.txt file in the extracted folder, that gives a brief description of all the features and how an admin can use it. CSF is NOT a firewall. Iptables is the firewall on most Linux systems. CSF is an interface to iptables, extremely useful interface, but definitely NOT a firewall. Please correct.